I’d like you to imagine an alternate universe where Rare/Ultimate Play The Game’s Spectrum classic Jetpac wasn’t just a huge hit, but was so influential that developers were still doing their own spins and refinements on it for generations to come. I’d also like you to imagine that people in that world are obsessed with cute, fluffy sheep. In that dimension, something like the newest game in the Air Supply series from developer Quantum Sheep might seem somewhat pedestrian. In our reality, however, Air Supply – SOS ($1.99)’s action-packed twist on the Rare classic is pretty special. It occurs to me that I should clarify that this game has nothing to do with the band, since someone always asks. Up until now, the Air Supply series has paid respects to the UK classic computer in its presentation, but the auto-running gameplay has had its feet firmly planted in modern mobile trends. This time, though, there’s no going back. This is the kind of game that used to rule the roosts, albeit with a few extra ideas to keep its vintage feel from turning rusty. The premise isn’t too far from Jetpac at its core. You play as Spaceman Sam, at least initially, and in each single-screen stage, you have to rescue a set number of sheep that descend into the play area. All you have to do is fly over them to pick them up, then drop them off by touching your ship. Once your rocket ship is full of wooly creatures, you blast off to the next stage. Of course, it’s not quite that simple. Aliens of all shapes and types are flying out of the sides of the screen constantly, UFOs will occasionally descend to lay out a ridiculous amount of heat, and each planet you uncover also has its own unique trick, like a sniper or moving laser barriers. Then there’s that persistent nemesis referred to in the title, your air supply. It counts down, block by block, over time, and any hits you take will cut your reserves down by a block. If you run out of air, you’re finished. Fortunately, oxygen bubbles drop in one-by-one as you play, along with other useful goodies such as shields, new weapons, or screen-clearing bombs. Star icons will also drop into the field, and serve as a collectible that opens up new options once you accumulate enough of them. You have to balance your play carefully. If you focus completely on sheep, you’ll surely run out of air, but if you don’t scoop up the sheep, you’ll eventually lose the battle of attrition and fail the stage. There are 100 stages in total, divided among 10 different planets. As I already mentioned, each planet has its own gimmick hazard, and the layouts of platforms and such also vary every few stages or so. 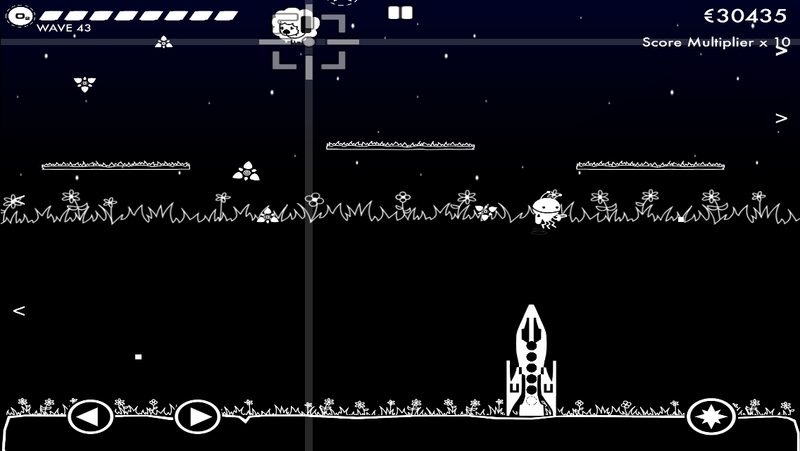 After completing the final stage on a planet, you’ll face off against a big boss alien before rocketing off into a bonus stage that plays a bit like Asteroids. All the while, you’ll be unlocking new things, including new characters, colors, music, and perks. There might even be some very special bonus levels in there for those who are dedicated enough. Each unlockable category is tied to one particular action you take during regular gameplay. As an example, rescuing sheep counts towards opening up new perks. These goals are staggered well enough that you should always be on the verge of unlocking something new, which is great motivation to push on for one more game, even if you’re having trouble with the current stage. Unlockable bonuses are nothing new for the Air Supply series, but the perks are something different from the usual. Basically, when you start a new game, you can choose two perks to bring with you. You’re locked into those perks for the duration of that play session, so you can’t game the system too much. These perks run the gamut from things that help you survive, like extra air, to things that help you rack up more points, like a roomier rocket ship that seats more sheep. They’re fun to play around with, but more importantly, they help ease the difficulty when you’re getting stuck. Even if you fail again and again, as long as you keep rescuing sheep, help is on the way in some form. Each of the game’s 20 characters also has their own weapon that will unlock with them, which you can then use with any other character. Some of these can make things a bit easier as well, with the robotic JCho’s weapon a particular favorite of mine. The huge list of stuff to unlock helps with the game’s presentation, as well. Initially, it’s just a black and white game, and you have but one tune to listen to, but as you play and unlock new colors and songs, it helps freshen up the game. The final unlockable color gives you a real Spectrum experience and is well worth the effort. The graphics are very simple, but they maintain the distinct charm of the series, and the minimal color palette use makes everything stand out clearly, if nothing else. As in the other Air Supply games, the music is excellent in SOS. It’s all chiptune synth created using a ZX Spectrum, and with 11 different tracks on offer, you’re sure to find something you enjoy blasting alien reel-to-reel tape players to. The controls are very simple, with three virtual buttons handling the work. Left and right arrows move you in either direction, while tapping the button on the right side of the screen thrusts you up and slightly forward, firing off a shot at the same time. 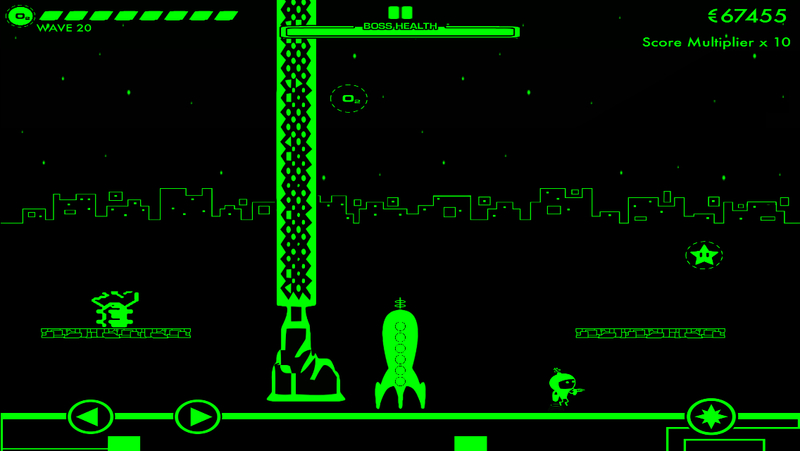 For those who never played Jetpac, the closest comparison is probably Joust. You have to keep tapping to maintain your altitude, and if you want to shoot, you have to consider how that’s going to affect your movement. You can’t easily hang in one place and fire in a straight line, so there’s a bit of technique you have to pick up. Speaking of picking up, you collect sheep just by touching them, and drop them off by touching your ship. The enemy collision is a little fuzzy since you pretty much just take damage and pass through them, but that’s probably for the best since you’d get bounced around like a pinball otherwise. It’s a fairly simple action game, but sometimes those are the best ones. The basic rescue mechanic and the need to keep your air supply up keep you moving around the stage instead of playing it safe, and the variety of stage layouts and enemy patterns combined with each planet’s special hazard means you’ve always got something new to deal with. There’s a ton of unlockable content that is all earned through regular play, and not a bit of IAP to be found. It has a few bugs at the moment, most notably the Game Center support not really working at all, but overall, Air Supply – SOS is a great bit of straight-forward, challenging action, stuffed with more content than you would expect from its humble appearance. 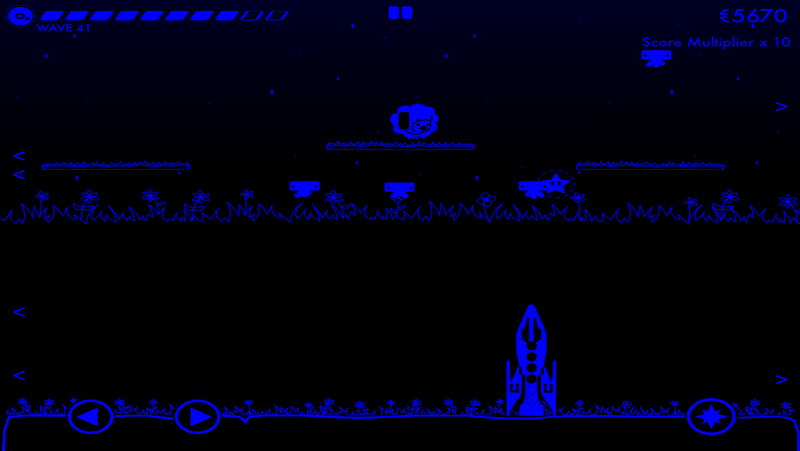 It is quite successful in both paying homage to Jetpac and building on it. If you’ve got even a little bit of love for the single-screen action games that used to dominate the hobby, you’ll want to pick this up and start counting sheep immediately.